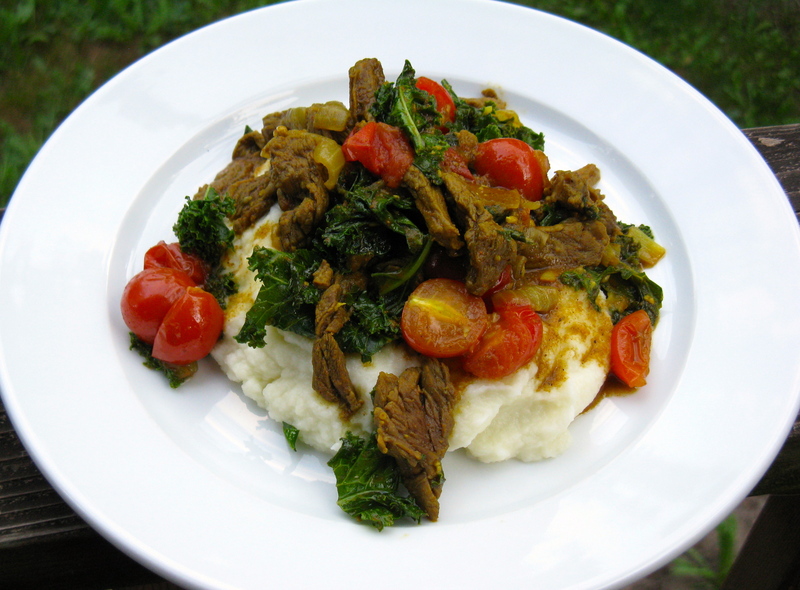 Doesn’t this curried skirt steak and veggies just scream comfort food? Look at it in all its glory sitting atop of that buttery cauliflower mash? Are you drooling yet? It’s so fresh and divine, yet simple. On an unrelated note, I’m hoping for some better sleep this weekend. The past couple nights have been problematic for me, with lots of tossing n’ turning and frequent waking. We did have a full moon this week though, so that’s probably why. I kid you not, but literally every time there’s a full moon, I do not sleep well. I know this isn’t uncommon, but sometimes I wonder if I’m going to turn into a freaking werewolf or something! Other than that, I’m thinking Jesse and I will have a date night this weekend. I think we could both use it and we haven’t had a date night in a long time. Usually it just consists of dinner out, but it’s good enough for the both of us and kinda fun to wear normal clothes for a change too since we live in workout clothes. Melt butter, ghee or coconut oil in a large pan over medium heat. Add the onion and garlic, and saute for 1-2 minutes. Next add the skirt steak strips and season to taste with sea salt. Stir and continue to saute. After a 2-3 minutes, add the curry powder, smoked paprika, coriander and chicken broth. Stir and then add the cherry tomatoes. Continue to cook for another minute, and then add the kale leaves. After another minute or so, once the meat is cooked through and the kale is softened, remove from heat and serve. I recommend eating over buttery mashed cauliflower. It’s even good all on its own. Uhhhh I’m the same with full moons! Don’t know what it is though! So good that you get a day off from work, hope you enjoy your day and your weekend actually 🙂 it’s a long weekend for us this week. Tomorrow will be the usual gym in the morning and then grocery shopping, then we have to stop at the real estate agent to sign our lease agreement for our new place. We move in on Tuesday which is when we get the keys but we’re hoping we can get the keys earlier so we can start moving some of our stuff in earlier. I knew I wasn’t alone with full moons! Isn’t it crazy how that works? I’ve heard it has something to do with the tides and equilibrium. Anyway, enjoy your long weekend and good luck with all the lease/moving stuff! That’s exciting and I know you’ve been anxiously waiting to move into your new place! Understandable! Moving is kinda stressful and a lot of work. Deep breaths, Naz! Yum! Have a fun date this weekend and I wish you a good night’s sleep. I’m with you on that one! !